Since this week our class is using the book, Chicka Chicka Boom Boom to review the letters of the alphabet. I have looked for ideas to incorporate into the lesson besides completing the alphabet pages for the students' own Chicka Chicka Boom Boom book to take home. I have found quite a few activities and lesson plan ideas. Listed below are just a few of the resources available. I am currently working on designing a cross curriculum comprehensive Chicka Chicka Boom Boom Resource Book. Check back for updates! I have created a lesson plan incorporating the Chicka Chicka Boom Boom theme throughout the content areas and interest areas. Feel free to download and use in your classroom. Not all of the ideas listed on the lesson plan are my own ideas. Some I have borrowed from co-workers and found on the internet. To introduce the book, wear khaki overalls and safety pin construction paper letters all over them. Wear a hat that resembles coconut tree fronds. Ask the students to guess what you are pretending to be. Tell the class you are a coconut tree. Read the book to the class and stop when the alphabet is up the tree at “oh no” and have them predict what will happen next. Record their responses on chart paper. Language Development: with attention to vocabulary and syntactic structures. 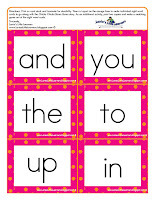 Sight Word Cards >> I have designed sight word cards to go along with the story. There are approximately six sight words used frequently throughout the story. 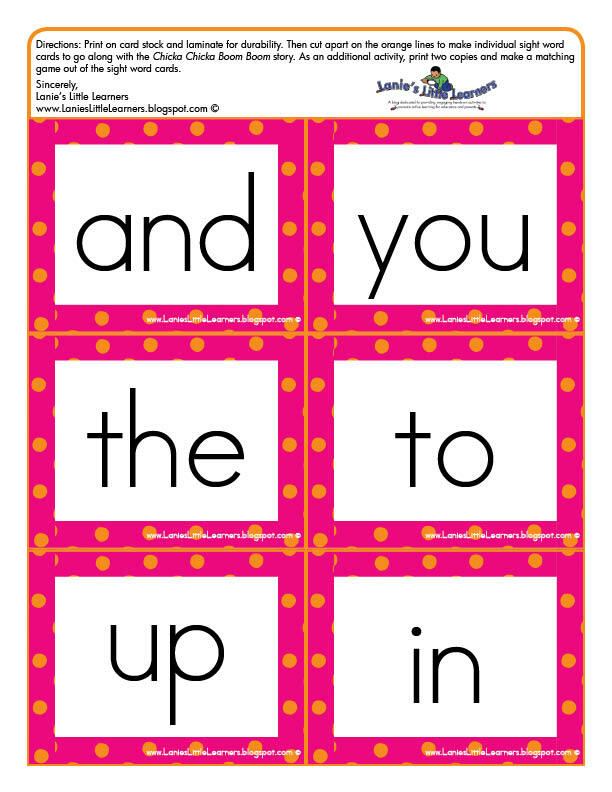 There are several ways in which the sight word cards can be incorporated during the read aloud of the story or as a follow up activity. Some suggestions include: memory concentration game, the use of magnetic letters and have children match the letters on the card. Comprehension Questions >> You should only tackle these comprehension questions after reading the book to your child, at the minimum, at least two times. Some of the questions are open-ended which can lead to valuable discussions. Take the time to listen and respect your child’s point of view. The comprehension questions are from Read It Again.com. For their entire list of CCBB Activities click here.